I always have to mind my head at the Dog Inn due to the beams, with garlands up even more so. As usual the room was pleasantly warm, but not overly so. The table wasn't over-burdened with frippery and although seemed small turned out large enough to accommodate plates, sides, and gravy boats. Cutlery was shiny; knives were both pointy and sharp; soup spoons dull, but not thick; dessert spoons thin, but not too sharp. Each also had enough heft not to feel like toys. It was a pre-ordered choice from a set three-course menu so no need to order and food came out speedily (then again it always has). Unusually for me I started with the soup I normally find it too filling, but given the time of year led to me pick something a little warming and I'm glad I did. Cream of celery and apple - thick, and flavoursome. Better yet sans the celery slices often marring such offerings and replaced with apple slices. 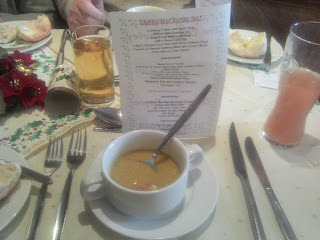 Sadly I guess they'd been added first with the soup on top as they'd clustered around the bottom; the soup would have been thick enough to suspend them. If I'd known I'd have mixed it up a little more; as it was the latter part was a little applely. By no means bad, merely in respect to the upper half. A small smattering of croutons that had softened enough not to be rock hard; but not so much as to remove the point of the differing texture. At first glance perhaps a little miserly with them sitting in teh centre, but upon eating they proved to be a fair amount. Hot, but not burning just the way it should be. The roll that we all had was a roll; no choices just a simple soft white roll. Butter was a standard rectangular packet which was soft enough and easy to spread, but it lacked the round taste I associate with butter. Again by no means bad just average. I also prefer a soft roll over the spray of crumbs a crusty one can leave everywhere. Next for me was Roast Local Turkey with Sage and Onion Seasoning and Cranberry Sauce. A little misleading as the cranberry sauce didn't come with it but was a shared dish. Alongside the menu items a small sausage wrapped in bacon which seems to be de-rigeur and a single large roast potato. As a shared side plate the options were large boiled potatoes drizzled with oil and basil (or possibly parsley, not quite as peppery); sprouts; and onion strips with small pork shavings. 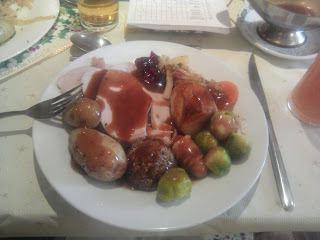 Turkey was excellent - plenty of it; thick slices white meat; though a slice of dark hiding at the bottom. Flavour you just don't get out of the water-packed supermarket variety. This was unmistakably turkey. The bacon and sausage were, well bacon and sausage; always seems to be the fat little sausages and minutely over-streaky bacon. Not bad, not praiseworthy. Roast potato... yep it was a jacket; I'm glad there was gravy to spare as I had to cut it open and pour some in. (as I've said elsewhere roasts maintain moisture, jackets are drier). Pleasantly the skin didn't need a chainsaw to get through, the pointy knives aiding in cracking it open. The sage and onion seasoning was a large ball sitting on the side of the plate. I'm not a fan of this flavour and this offering did nothing to change my opinion. I have no objection to the constituent parts of this flavour of stuffing/seasoning, but I find sage is always overdone. It's like rosemary and lamb, when overdone even adding the smallest amount of so pungent a herb renders the meat tasting of nothing but the seasoning especially with a delicate white meat. Sadly this was sage and onion seasoning. Onto the additionals and the boiled potatoes had flavour; far to easy to boil it out of them and just let the oil and seasoning make up for it. The onions were well cooked to the point of soggyness, but not over. Personal taste I'd have preferred them a minute touch crisper to add a different textual note to the dish. Though I will say that the pork shavings adding a light touch of saltiness which negated the need for additional seasoning and were proportioned well through the onions. The sprouts... ah these were a little disappointing. But sprouts are a finicky vegetable; far too dependent on weather conditions during growing over style of cooking. Well cooked, but a tad too harsh and sadly bullet-like in consistency; it was a task to spear them ready to cut and much sawing action was required. Ironically marrying the flavours of the over-sage with the over-sprouts helped alleviate each with the cost of losing anything else though. Oh and the cranberry sauce was, cranberry-ey enough, but I've had fruiter. It worked well enough with the turkey and didn't overpower it; which is what I want. Plates could have done with being a little hotter; by the time shared servings had gone around they were hitting luke-warm; the hot gravy helped though and mainly due to this the food remained warm enough. With two heavy dishes and the knowledge of a journey ahead I'd made another, for me, unusual choice in dessert - Luscious Lemon and Lime Cheesecake. I'm not a cheesecake fan, I normally find them a cloying affair freeze blasted to remove all flavour and texture, and sitting on a thick slab of a base made up of cheap digestive biscuits. This, however, had been recommended to me. Ah now this is what cheesecake should be; the thinnest of bases, the lightest of tops. The hint of lime within the 'cheese' and the addition of the lemon as a sauce. I heard one minor comment regarding the 'from a can' whipped cream rather than the pouring variety; and normally I'd agree. In this case though it was the right decision. The airy and super light pressurized 'foam' was the ideal accompaniment to such a smooth cheesecake, pouring cream would have masked the subtle flavours inherent in the dish. 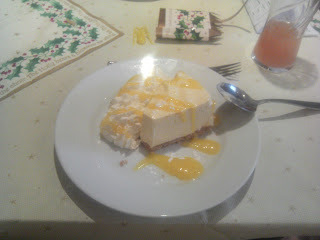 Only one teeny tiny flaw was the amount of lemon sauce - over the cheesecake and in artistic swipes on the plate is fine; over the cream as well was a little too much. As a finale coffee and a mint. Pretty much required to prevent me napping I still inwardly sigh a little at this 'course'. The stuff being served seems to be treated as something to shot-blast clean your tastebuds of all the prior courses and sit as a harsh layer seeping through your stomach. In this instance it was just right; coffee with enough of the cocoa sharpness without the stringency it seems far too many associate as being the "proper coffee taste". The chocolate mint, was a chocolate mint. I've had better I've had cardboardier. One extra 'course' of the meal deserves recognition - the service. Multiple wait staff who were quick, efficient, tidy, and cheerful. A good staff can't save a poor meal; but a poor one can ruin even the best and I'm glad to have been served by both a good staff and with a good meal. In conclusion eating at the Dog at Dunley will not be a let-down. This is my second visit and was good as the first. Definitely something I'd want to repeat. Even being busy, and with a crying baby* during one part, did nothing to mar the experience. If you've not been; book it. *No blame to lay on the parents it was brief and these things happen; and thanks to the acoustics of a low ceiling, angled beams and walls as well as wall hangings surprisingly dulled given it was only a couple of tables over on a direct line-of-sight.